Checked out Taste The World in Fenton Village today. Glad the weather held up because the event was a great success! Scooped up my passport and my free "Taste the World" recyclable bag at parking lot 3 on Fenton and I was on my merry way. I'd like to suggest to the organizers for next year they have an actual section (alongside Home, Restaurants, and Contact) on the website with specific instructions on where to go to pick up the passports. They did note it in one of their entries but it was easy to miss. 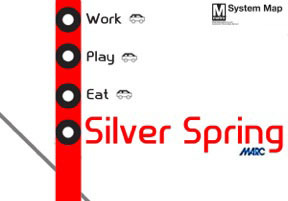 I know some first timers referred to Silver Spring Speaks who had the details and instructions spelled out clearly as opposed to going to the actual Taste the World website for details on what to expect. They had 24 restaurants confirmed this year and I wish I could've tried each and everyone. Stopped into Lotus Cafe for some dumplings (pot stickers). Next made my way down Georgia and popped into Pacci's. I will say, I was a little bit disappointed with the only 2 options Pacci featured: Margherita and La Diavola small pizzas. It would've been nice if they had a few appetizer options as well. The two they chose are staples for Pacci's and if you're a local from the neighborhood and you've been there before, you've most likely already had those. Yes - I understand that for someone stopping in to sample for the first time, those are great go-to's, but I would've liked to have seen other options in addition. La Diavola pizza was on point. They use San Marzano for the sauce. Delicious! Swung by Abyssinia and they featured 4 of their vegetarian dishes at $5 a piece. Piratz Tavern had quite a few options and even a kids menu. Can't go wrong with $3 sangrias or $2 modelos or a cup of Shrimp Bisque for $1.50. I think next year the organization should require the restaurants to feature more than just 1 sample. For example, Lessac Ethopian Cafe had only 1 item - vegetarian sushi. That was a weak showing if you ask me. It would also be awesome if they could post what the restaurants were sampling on their website in advance. It would help us map out our tour in advance. Overall, I thought it was well organized, the restaurants were ready and prepared for us, and the event had a great showing. Would love to see more of these functions in the neighborhood! So Jackie's charged $5 for one mini elvis burger when they serve them at the restaurant, cooked to order for 2 for $9 regular and 2 for $5 happy hour? Yeesh! They should view this as an opportunity to draw new customers in, not to bilk them. We were talking about that! I totally agree. We even saw a few people walk in and look at the menu and then walk out. Not sure why they did that. (Although they were delicious). Also would've liked to have seen something that wasn't on their typical HH menu for repeat customers that came out. Love this post, so fun all the places you went to! YUMM!